Cold Craft, Inc. specializes in the design, installation, replacement, maintenance and repair of wine cellar refrigeration. We work closely with general contractors during the wine cellar’s construction phase and we also replace wine cellar refrigeration when it no longer serves the cellar. The wine cellars that Cold Craft, Inc. has worked on range from a small 90 square foot room that was prepared for wine cellar refrigeration located in a Los Gatos garage to very large wine cellars capable of holding thousands of wine bottles, and having different temperatures for different wine. Cold Craft has worked for a variety of clients from retired wine makers to the executives and titans of Silicon Valley. We are very protective of our customers’ names and we often sign non-disclosure agreements to show our clients that we are serious about confidentiality. Cold Craft, Inc. is also a full-service heating, ventilation, air conditioning and refrigeration (HVAC R) for residential and commercial accounts. Typically these services are geared for locations within 30 miles, further if there is more equipment to make it worthwhile for the customer. That means that we routinely perform maintenance, service and installation functions. We bring commercial know how to the residential experience. Cold Craft also has experience installing unique heating and AC products such as geothermal, VRF/VRV systems, into residential and commercial buildings. Geothermal systems use the earth’s temperature to heat and cool buildings and the VRF/VRV systems use limited pieces of equipment to provide custom temperatures for each room or zone in the building (residential or commercial). We service and install all types of HVAC equipment (natural gas, water sourced heat pumps, air conditioners, heat pumps, air filtration and mini-splits). Cold Craft provides seamless comfort. The firm also works with all types of households from those needing standard HVAC replacement or service to those requiring unique equipment or service. We have the knowledge to do things that others won’t tackle. Let us help you keep your wine safe, live and work in thermal comfort, or to go green by reducing your carbon footprint. 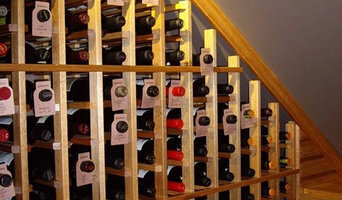 We provide local wine storage design services for homeowners and businesses in San Francisco, California. Wine Hardware is your one stop shop for high-quality custom wine cellars, wine cabinets, cooling equipment and wine accessories that wine connoisseurs of all levels will enjoy! Located in the heart of wine country, we serve all wine lovers from all over the globe: from China to New York and in our own backyard, Napa and Sonoma County. Thomas Warner Wine Cellars combines the finest materials to create an inspiring cellar that will showcase your collection while maintaining the longevity of your fine wines. We specialize in custom-made, hand-crafted wooden and metal wine cellars. Our most current projects include bronze cellars, blackened steel and a combination of wood and metal designs. Sensational! Whether your collection is comprised of a few hundred bottles or several thousand, we are able to customize your cellar to reflect and represent your lifestyle and your home. Tom is committed to a team-oriented approach and will collaborate with your design team, building contractor or simply see the project through, start to finish. Vino Cellars opened up in 2003 and located in Livermore, CA. 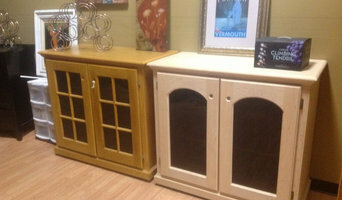 You can visit our showroom by appointment to view our wide array of wine cabinets and custom racks. You can also shop us online at www.vino-cellars.com and www.winecabinets.com.. Whether you are looking for a cellar for your home or business, we can assist you with all your storage options. Specializing in custom cellar design, temperature controlled wine cabinets, cooling units, and wine racks. Located in San Francisco and serving a 200 mile radius (Bay Area, Wine Country, Sacramento, and Sierra Foothills) for custom cellar, cooling and racking projects! 40+ years of industry experience! Established in 1973. Wine Appreciation (formerly The Wine Appreciation Guild) provides wine accessories and wine storage and has done so for over 40 years. We service the entire US in aspects of our business. As the oldest company and the most trusted business in this sphere of the wine industry, we hope you will continue to count on us for the finest wine corkscrews, accessories, wine cabinets, wine racking and wine cellars with the best pricing and service. Original oil paintings, created in and of California's premier Agriculture Viticulture Areas, including: * Napa Valley * Los Carneros * Sonoma Valley * Sonoma Coast * Howell Mountain * Alexander Valley * Yountville * Russian River Select original oil painting studies to serve as the inspiration for a larger commissioned custom-sized original oil paintings to feature in your wine cellar or cave. Choose from Exclusive Edition Giclée (zhee-clay) hand signed fine art prints, available in custom sizes. Ann Rea’s Wine Country oil paintings have been featured in Fortune and The Wine Enthusiast magazines and on HGTV and the Good Life Project. Rea’s artistic talent is commended her mentor Wayne Thiebaud, an American art icon. We are a general contractor specializing in the installation of the Stonework Cellar, a high capacity cellar system that can be installed beneath almost any room in your existing or new home. 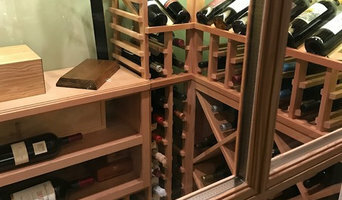 The cellar typically holds between 450 and 1500 bottles, and is accessed via a hatch door in the floor of any room in your house, your garage, or your yard. The concepts for our wine cellars come not only from being an aficionado of wine, but also from years in the wine business. We understand how to take care of wine. The perfect custom wine cellar starts with the design. And our designs give you a personally-tailored wine cellar that becomes more than just a place to store wine - it becomes a place to fit your lifestyle. We have designed cellars from closet conversions to larger installations; traditional to modern. 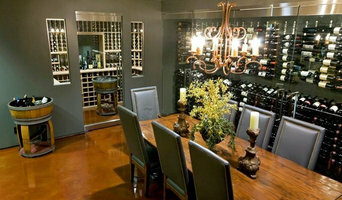 We’ll design your cellar to be elaborate as a showplace, or utilitarian for storage only. The principles of Affinity Creative Group are simple: to deliver the possibilities of the idea that you, as a client, bring to the table. Affinity is different because they aren’t limited to a house style. What you get with Affinity Creative Group is a collection of highly creative designers that want to be your partner in branding. Originality and vision are key in the approach that Affinity wants to deliver to you. The possibilities are limitless, so come along on a journey of imagination and opportunity with some of the most artistic, inventive and ingenious schemers available anywhere. The mission of Affinity Creative Group is clear – it’s the strength of the partnerships, attention to detail and experience that raise Affinity beyond the competition and into the stratosphere. Inventors of the best and easiest to use wine saver: Savino. Your Half Moon Bay, CA wine cellar professional also will oversee the preparation of the target space (moisture barriers, ventilation and so forth) as well as the construction process. Wine cellar builders select and install the necessary equipment and surfaces, from racks and cabinetry to flooring and lighting, and often handle special security systems to protect a homeowner’s collection.